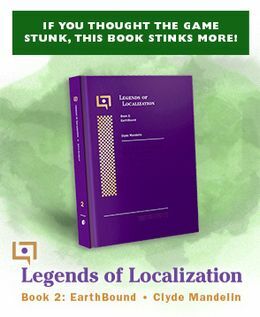 Marcus Lindblom, the localization director behind EarthBound, has been actively in touch with a lot of folks in the EarthBound community, which is really cool – even I’ve chatted a few times with him online! 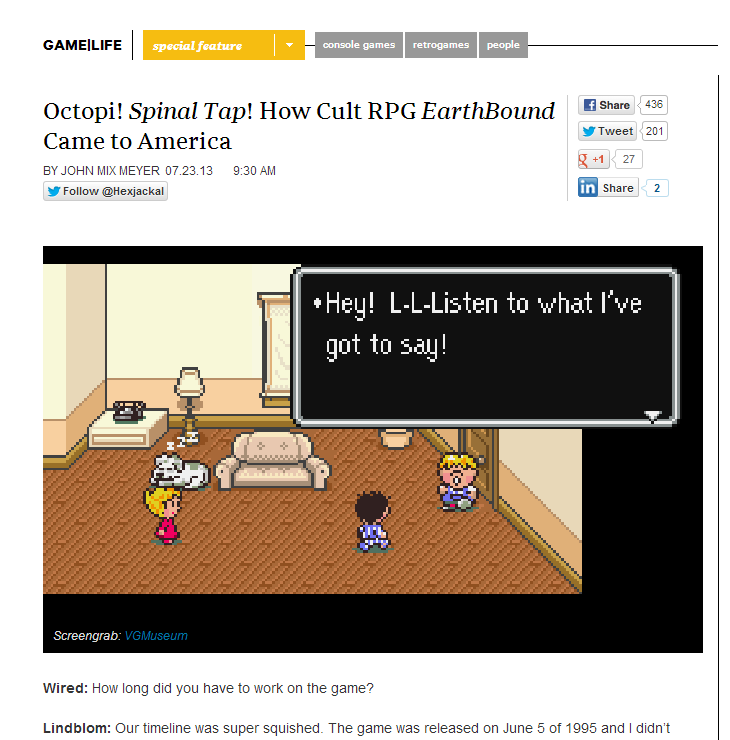 After the re-release of EarthBound on the Wii U last week, Wired recently published an interview with Marcus in which he discusses the process of localization, some of the choices and changes that were made, and even some stuff no one else has ever known about until now! Hm, as much as i played the game, i don’t ever recall any lines that seemed like Spinal Tap, Bugs Bunny, or Benny Hill. I’ll have to keep an eye out for that as i’m replaying the game on the VC. Well, that answers the “pray” conspiracy. Awesome moment when he talks about how much it meant to him that people wondered about why the name Nico had been added in. Ness1985: What part of the Buzz Buzz text recalls Bugs Bunny? I always loved when he did that, so funny! I wonder if the story in the house you can read (about the guy claiming his wife is in labor to avoid a ticket – “THIS IS A DEMON CHILD”) was also a personal thing put in by this guy. No, that’s in the original text too. I never seen a cross on a tombstone. Does anyone know about this? The tombstones in Magicant were crosses. There is one question I would ask if I could. Ness’s pajama sprites for the beginning/ending ([1B5],$D1:BA00) and his Magicant pajama sprites (,$D1:C0C0) are identical, yet occupy different spaces in the EarthBound ROM. In the original Japanese version, Ness kept his hat in Magicant because his hat is important to him, much like Mario’s. However, when Ness’s Magicant sprites were overwritten with a copy of his pajama sprites, he lost his hat. Obviously, a straight copy would be easier. However, because the sprites are not compressed and occupy different locations, there is no technical limitation preventing a tile editor from adding his hat to his Magicant pajama sprites without altering the rest of his clothes. My question would be: Why did the localization team not go the extra mile by keeping Ness’s hat and adding pajamas to him at the same time? Is it a deliberate design choice, or is it to keep costs low? Everyday, I find yet another reason why i love this game so much. I’m *still* reeling from the discovery that “Giygas” is pronounced with the long “e” sound, not the long “i”. I had been saying it wrong for fourteen years. I know it only makes sense it would be pronounced that way, given his Japanese name, but “GUY-guss” to me just sounds so much more big and threatening. I thought it was “Gih-guss”. So… I was pronouncing ‘Giygas’ right all along? The story about naming one of the Magicant characters Nico after his daughter was very touching. Unless I missed it, it would have been nice to have word on the Pokey/Porky thing to finally put that thing to rest. I still feel like they intentionally changed it; mistranslations aside, I feel like even if it was an accident, the pig themes were obvious enough that they would have caught if that’s the case. I’ve always said “Guy-Giss”, I don’t care if it’s wrong. That’s how I’ve always said and prefer it. … I’m not the only one here who’s English and pronounced “Giygas” right am I? Great read, someone in the comments of that article also put a link to the conversation in the earthbound stream when Marcus Lindblom was chatting which was another great read. The only thing I still really want to know is the shop in the desert still being labeled as DRUGS when it was changed everywhere else. What happened? Although, it’s pretty damn funny, kind of like how Poo’s name is Poo. I like his Marcus’s reasoning for keeping Paula’s command as Pray. Yeah, the game really felt perfect with the praying at the end. It always gave me goosebumps that everyone was praying to destroy the universal cosmic destroyer, heheh. Eh, not everyone; only Paula was praying. Though it was kinda disturbing… Like, they have no hope… No escape… So Paula tries to pray to her friends… And miraculously it worked. ANNIVERSARY? HAPPY ANNIVERSARY THEN, MOTHER 1 OR AS I LIKE TO CALL IT EARTHBOUND ZERO! So maybe Corey was talking about how everyone else was praying for the group. I agree with both of you, though. It did add a bit of a helplessness and creepiness to the theme of the final battle. I definitely remember feeling very helpless the first time I fought Giygas and didn’t know I was supposed to pray. I got a lot of things from that whole element. First, there’s the simple fact that you sent 4 KIDS to destroy cosmic horror. What chance do kids really have? The rest of the world, the whole world, had to band together to save those kids and themselves. There are other elements, like how Paula’s first prayers are “swallowed up by darkness”, so whatever she firs prays to isn’t going to help. People can’t just depend on a miracle from outside, they have to create that miracle themselves! So instead, Paula prays to every single person they’ve ever met, and somehow all of them focus enough of some sort of power to destroy the cosmic nightmare. That’s inspiring, and also seems to send a lesson of individual responsibility. @Jerk: There weren’t really that many pig themes in Earthbound. Those mostly came in Mother 3. It wasn’t an intentional mistranslation; the Japanese writing could be interpreted as either one. Basically they either took a 50/50 gamble on which was correct, or decided against “Porky” because it might be construed as offensive to overweight people.